From a bit of online research I learned that British explorer and navigator Captain James Cook was given the Copley medal by the Royal Society in 1776 for demonstrating that eating sauerkraut could prevent scurvy in sailors during long sea voyages. Scurvy, a disease that results from vitamin C deficiency, was a common disease for sailors in the 18th century. Sailors often had no access to fresh food while at sea for an extended period, and sauerkraut is high in vitamin C.
Sauerkraut, German for "sour cabbage", is made by chopping cabbage and soaking it in brine to ferment through the action of lactic acid bacteria. Sauerkraut is a common condiment throughout eastern Europe. Here is my recipe for making sauerkraut with photos of the steps. I clean everything thoroughly and give it all a dilute vinegar rinse (acid conditions are what you're going for, so this is good). I'm using a Gairtopf fermentation crock that is ideally suited for fermenting, but you don't need this to be successful. Sauerkraut and sea salt (or canning salt). Don't use table salt which contains iodine. 11 pounds of fresh cabbage (red or green). You're shooting for about a 5% brine solution (the water will come from the cabbage-- I will explain later) which is approximately 6 Tablespoons of salt for 10 pounds of cabbage. If you start with 11 pounds of cabbage, you'll end up with closer to 10# after cleaning (removing outer leaves and the hearts). 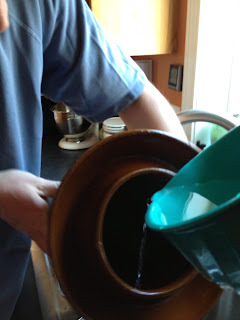 If you need to make more brine to cover your cabbage (unlikely). You just make more 5% salt solution (3 Tablespoons of salt per quart of water). Chop or grate cabbage (without hearts) finely or coarsely (however you want your final sauerkraut to be). I find that using a knife is both really messy and takes a long time. 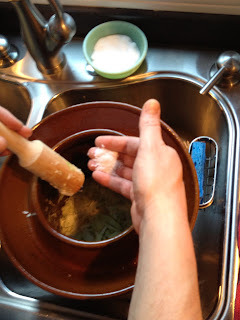 A few years ago I stopped using a mandolin for making sauerkraut after an accident that resulted in a trip to the ER, several stitches, and a reattached (though now numb) tip of the little finger on my right hand. I now use the grater attachment of out Kitchen Aid mixer. Though noisy, it makes less mess and is pretty quick. Put the shredded cabbage in a large bowl as you chop it. 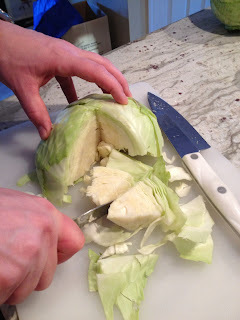 Pack into crock and add a sprinkle salt on the cabbage as you go. The salt extracts water from the cabbage and creates the brine. The salt also prevents the cabbage from getting mushy. Although I'm just making cabbage sauerkraut in the photos, you can add other vegetables (grated carrots), fruit (apples), and herbs/spices (dill or celery seeds, juniper berries). It's your sauerkraut so make what you like. 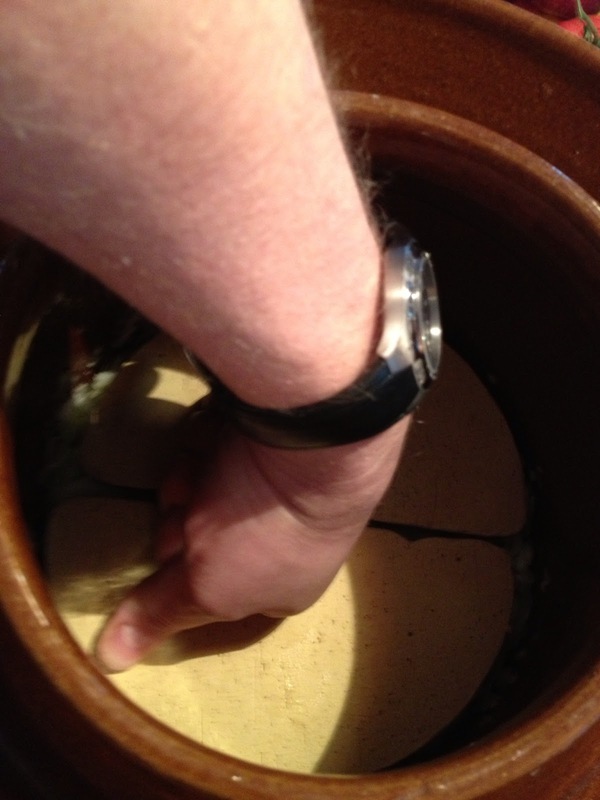 You want to pack just a bit into the crock at a time and tamp it down hard with your fists or a potato masher. I like the wooden tamper that came with the Kitchen Aid mixer. This prevents air bubbles in the crock and bruises the sauerkraut to help release the water. Put a clean plate or the crock weights on the sauerkraut and press down firmly. You won't get enough water out of the cabbage right away, so you need to wait. 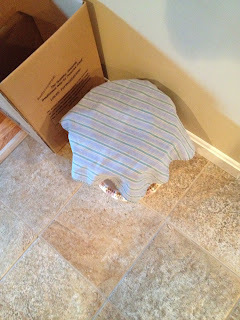 Cover kraut with a cloth and press down on the plate or weights every few hours. 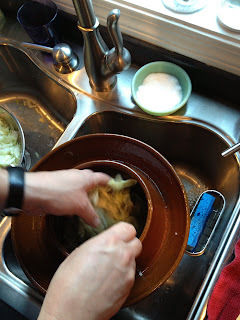 By the next morning, enough time has passed that the water is drawn out of the cabbage so that the cabbage and weights are submerged beneath the brine. 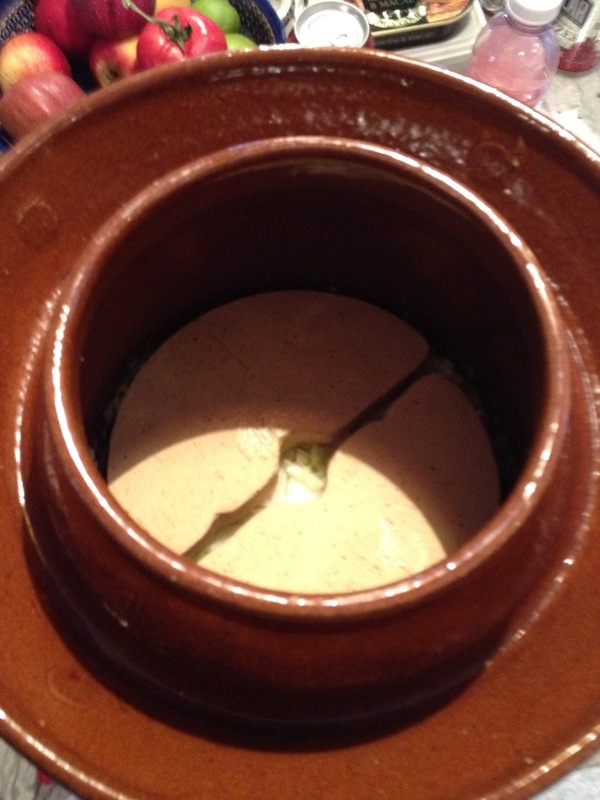 Cover with the crock lid and fill the water ring. If the brine does not rise above the plate level by the next day, you can add your own brine solution to cover. You must keep the weight and cabbage submerged to get good sauerkraut! Now leave it a few weeks to ferment. The fermentation is slower in cool weather, so try it in 2-3 weeks in summer and 3-4 weeks in winter. We like our sauerkraut pretty stinky (in a good way!) and it is cold this time of year, so I'll probably let this sit for a month. 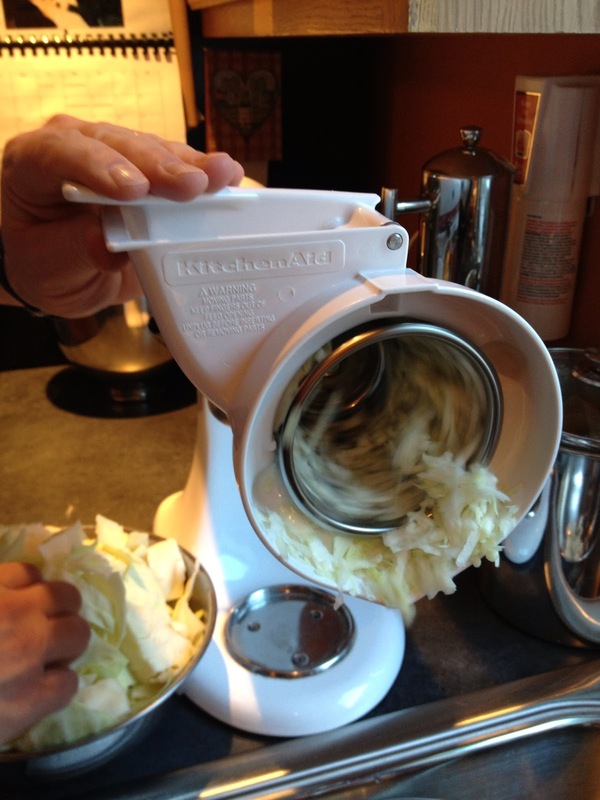 Taste your sauerkraut by removing the lid and weights and dipping into the fermenting cabbage with a clean fork. 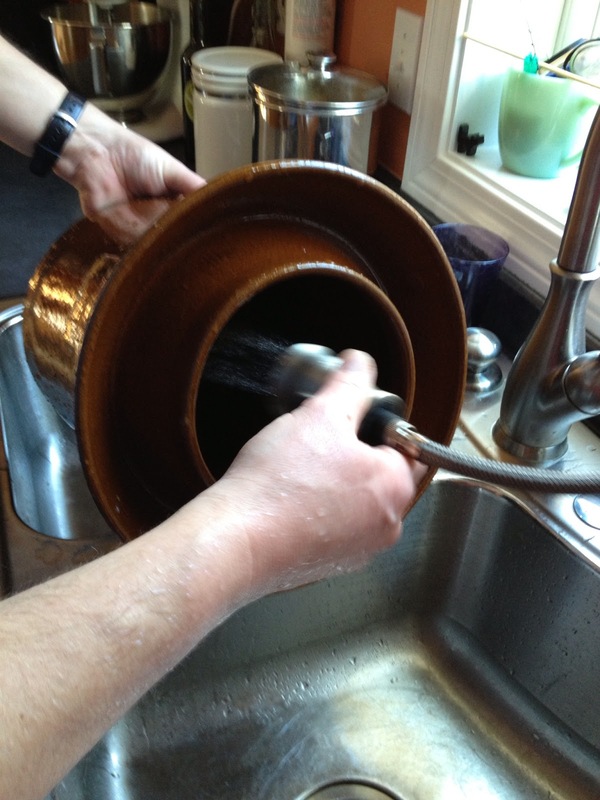 If it's not ready, then smooth the surface of the cabbage and press down on the weights to submerge and let it ferment longer. When the sauerkraut is how you like it, put in jars and refrigerate with a tight lid (you do not need to heat process can it). When you open the jars, the kraut will begin fermenting again (albeit slowly in the fridge). 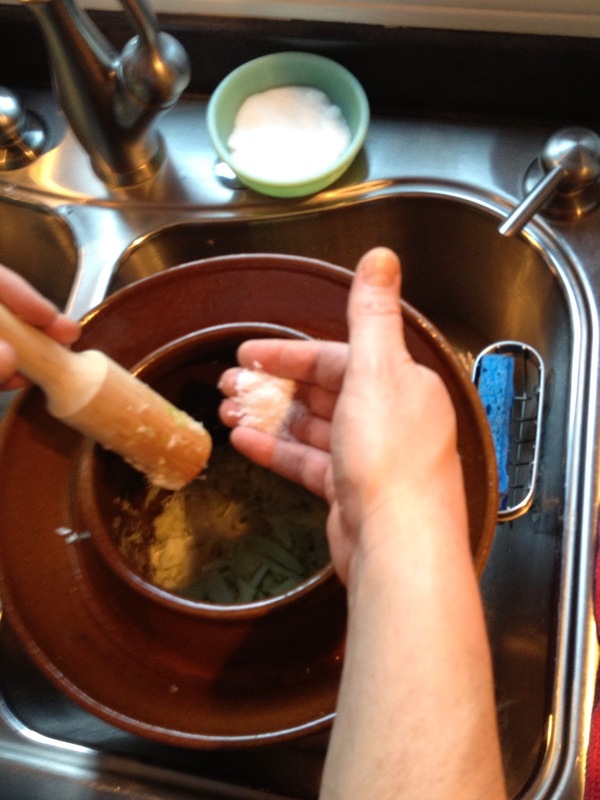 This is how we learned that we like our sauerkraut a bit more fermented than we originally thought. Although less common in the Gairtopf crock (because the water ring results in a good seal), sometimes you'll get mold on the surface of the brine. Don't freak out. Skim what you can off of the surface (a dry paper towel followed by a measuring cup work really well); though you will probably not be able to remove all of it. Rinse off the weight and taste the kraut. Bert loves our homemade sauerkraut and eats it most mornings with her eggs. It has a nice tangy taste with a decent crunch. So much better than the canned stuff in stores! If you're interested in making your own sauerkraut, I'd suggest some reading. Sandor Katz has a great book Wild Fermentation that is both a resource for recipes and a source for inspiration. And two months later the finished product is ready to put in jars. You know it's finished when the taste is just tangy enough. It will mellow a bit once you put it in the jars and store in the fridge. The eleven pounds of cabbage made 5 full large mason jars and a little extra. Sauerkraut ready to eat and store in the fridge. ENJOY! Enough to get us through to cabbage harvest.